Gilder Lehrman Collection #: GLC02429.36 Author/Creator: Hemans, Nancy A. (b. 1843) Place Written: South Dakota Type: Autograph letter signed Date: 23 July 1873 Pagination: 3 p. : docket ; 20.2 x 25.6 cm. Summary of Content: Discusses her garden and her growing son, comparing his dark skin to "a little niger." Indicates they will move to Bazille Creek, but will soon come back for the Convocation Meeting. Discusses money problems and a shawl she has yet to receive from Shiras. Reports conflicting stories about whether or not Reverend Hinman was killed by "wild Indians." "Daniel & I work pretty hard this spring. We had a garden and we went most every week to see out garden. We had plan corn, potatoes, onions, tomatoes beans ...and water melon. Our little Ally used to walk about the garden crying after me to take himâ€¦I could not have him to put on bonnet or hatâ€¦so he is awful dark, just like a little nigerâ€¦and he dont eat muchâ€¦and he is getting thin." "We are going to move tomorrow if we can, to at the Basille Creek. we will coming down again in some week for the Convocation Meeting." "â€¦the money is very scarce here. Daniel is got into big debt now, and ought to be very careful." 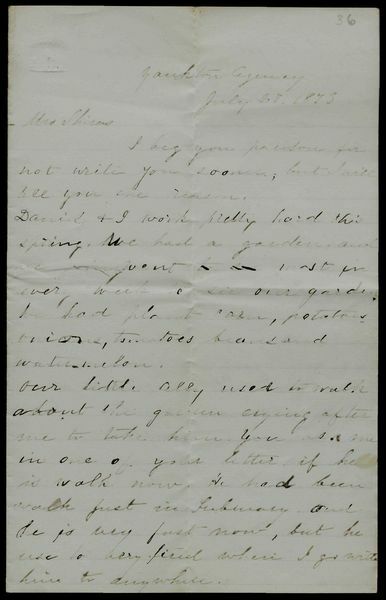 "Mr Hinman is not at home yetâ€¦In Sioux City paper said that Mr Hinman kill by wild Indians, but in same day Mrs H. got two letters from him so we dont know which is right."